NF impacts one in every 2,500 children born. As the most common neurological disorder caused by a single gene, NF is more prevalent than cystic fibrosis, muscular dystrophy and Huntington's disease combined. Several families impacted by NF are involved in the Links for Lauren golf outing and reception. Learn more about them below! This is Gus. Gus was a healthy, happy baby—the little brother his two big sisters didn’t know they wanted until he was born. When he was about nine months old, his mom began to notice cafe-au-lait spots on his legs, which led to an NF1 diagnosis. When Gus was 3 years old, he started growing too fast, getting too thin, and throwing up for no particular reason. After a series of tests and an MRI, Gus’ family received the news that their little boy had a brain tumor which required immediate surgery. Gus made a swift recovery and, two years later, continues to be closely monitored my his medical team at Mayo Clinic in Rochester. Gus’ story is just one of the tens of thousands that play out in the lives of families affected by NF in our country, every day. This reality compelled his parents, Gregg and Becky Erickson, to connect with the Neurofibromatosis (NF) Network and join their advocacy efforts in lobbying for federal research funding on Capitol Hill. After learning that their home state of Minnesota and neighboring Wisconsin were not being represented by a local NF Network member organization, Gregg established NF North Central. A true superhero fan, Gus likes to remind family and strangers alike that he will use his powers for good, and not evil. So now, joining forces with Lauren’s parents, Mason’s parents, and many others, Gus’ mom and dad are setting out to do the same. 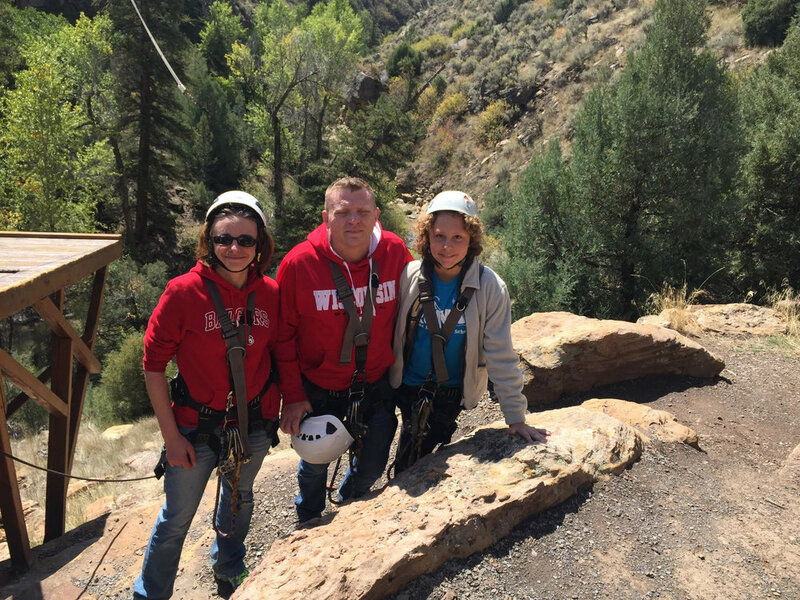 The Erickson family and NF North Central are dedicated to growing its regional footprint so that more families may have access to the resources every NF patient deserves. They will continue partnering with NF Network’s Advocacy Program to secure federal funding vital to the advancement of promising NF research studies, and they will endeavor to bring together the brilliant, creative minds of researchers and clinicians until a cure for NF is found. We are a family where all of us have NF. On the outside we may look fine but that is not the case. Olivia is 13 and in May 2016 had brain surgery to remove a tumor. Brandon is 37 and has had surgery on his spine, foot, and had other tumors removed as well. Sarah is 36 and has had brain surgery to correct hydrocephalus, spinal surgery, arm and leg surgery to remove tumors that were pressing on nerves, causing tingling and pain, as well as other NF tumor removal surgeries. NF is so uncertain and none of us know what lies ahead of us. We will continue to be strong and fight for a cure for NF. Meet Tim, Teresa, Mason and Paige. Teresa first realized something wasn't right with Paige almost immediately after birth, as Paige struggled feeding from a bottle after arriving home from the hospital. The ability to eat and gain weight were a constant issue in her first year and eventually required her to have a feeding tube. After a number of medical tests failed to find answers, it was finally revealed that Paige suffered from NF. Since her diagnosis, Paige has continued to struggle with low-muscle tone and the ability to gain weigh, while also dealing with speech and other gross-motor skill delays. In addition, she often has difficulty sleeping at night because of itchiness and pain believed to be related to NF. Tim and Teresa became involved with Links for Lauren because they want to educate others about the disease and help in the fort to find answers about NF. They have found a wonderful support system through Links for Lauren and have met a number of new friends who share in their experience. They would like to thank all of their friends and family who have helped contribute to finding a cure over the past two years. Meet Mason, son of Chuck and Malia, and brother to Alexandra. Malia is a speech language pathologist and Chuck facilitates research on the UW-Madison campus. Mason was diagnosed with NF1 at the young age of 1 year old. Mason has been on a long and difficult path because of a number of complications relating to NF1, one being a tumor next to his brain. However, he continues to amaze and surprise his cautious parents. Despite the negative affects of NF1 to Mason, he contues to strive and grow like a little trooper. Many smiles and laughter come from him, especially when he is next to Donnatella, the family pet! Meet Mark, Sara, Colin, Ethan and Harper. Mark and Sara are both nurses and Harper and Ethan are twins! When Harper was four months old her parents noticed that she had some café-au-lait spots and promptly pursued the pediatricians attention. The pediatrician made the clinical diagnosis, and at 6 months old Harper was genetically diagnosed with Neurofibromatosis Type I. The rest of the family was tested but Harper was alone in carrying the genetic change. One of the most difficult aspects of Harper’s diagnosis is not knowing what her future looks like. Right now Harper has café au lait spots, abnormal freckling and is slightly shorter in stature but there is no way to know if Harper will develop the skin lesions, tumors, or other health issues associated with NF1. Despite the unknowingness of her diagnosis, Harper is a happy, loving, spitfire of a little girl. She is smaller than her brothers but will play rough and tough with them nonetheless. She loves to be her mom’s little shadow, helping around the house and also has a unique interest in anything involving owls. Sara is ecstatic to have found a support system of other parents of kids with NF and encourages other parents to also reach out.